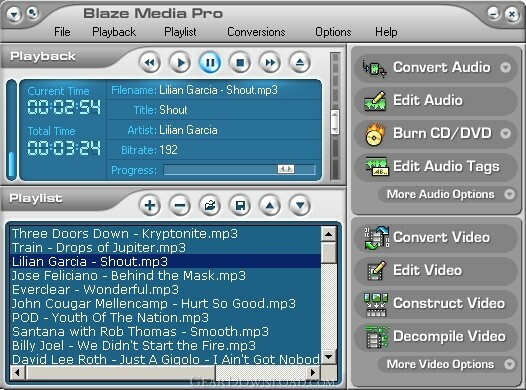 Blaze Media Pro - Powerful all-in-one audio and video converter, burner, editor, ripper, and more. This download (setup_blazemp.exe) was tested thoroughly and was found 100% clean. Click "Report Spyware" link on the top if you found this software contains any form of malware, including but not limited to: spyware, viruses, trojans and backdoors. Fx Movie Joiner 6.2.11 - Join videos of various size, type and frame rate. Motion Hunter 1.01 - Motion Detection Software. Take the advantage of being informed! Be sure! H264 WebCam 3.99 - 4-ch H264 webcam surveillance software.Broadcast audio and video to internet. Hornsoft Online TV 3.8 - Watch 1,000+ Online TVs for Free! Listen to 2,000+ Online Radios for Free! Allok Video Joiner 4.6.0529 - join AVI, Divx, XviD, MPEG, WMV, ASF, RM, MOV, 3GP, MP4 into one large file. CDH Media Wizard 11.0 - All-in-one audio and video converter, editor, recorder, burner, and much more! VideoConstructor 1.5.0.19 - Convert, join and split your video files, rip DVDs, create DVD-ready slideshows.